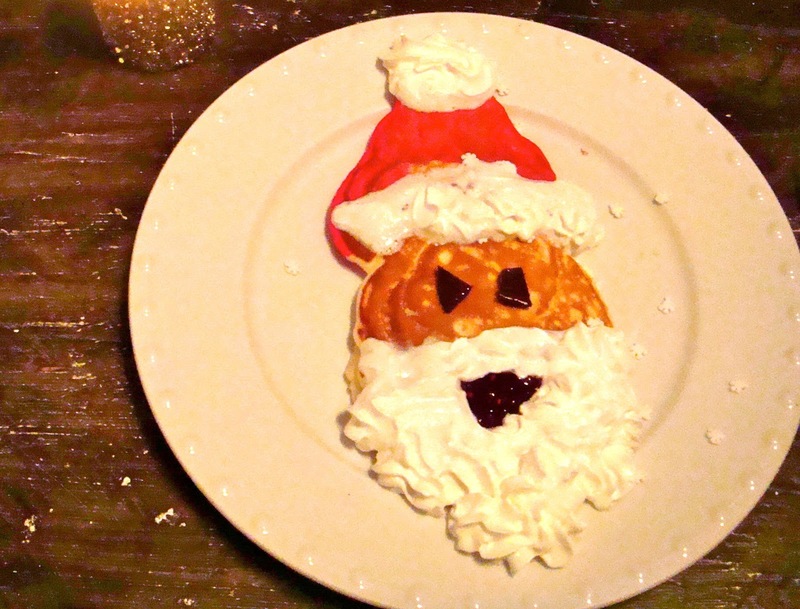 a new bohemia: santa pancakes. The little ones came to the breakfast table, bed head and rumpled jammies, and were greeted by a candle light breakfast featuring Santa. Eyes opened wider and Christmas fun scored another point. 2. Once the batter is complete, remove 1/4 of it and place into a smaller bowl. 3. Into the small bowl, add a drop or two of red food coloring and stir well. 4. Now, on a hot oiled griddle, form a round (with the uncolored batter) for Santa's face and then form a triangle (with the red batter) for his hat. Make sure they connect. 5. Cook on both sides (tip: I found it to work best to cook a bit longer on one side, then flip and cook for just a moment on the opposite. Serve with the lightly cooked side facing up and you'll ensure that your color stays vibrant. 6. Remove from heat, place on serving plate and allow to cool slightly. *Oh! And the magic of a Santa pancake shouldn't be limited to your little ones. Christmas laughs and smiles guaranteed from loved ones of all ages. Categorized: holiday: Christmas., little bohemians.